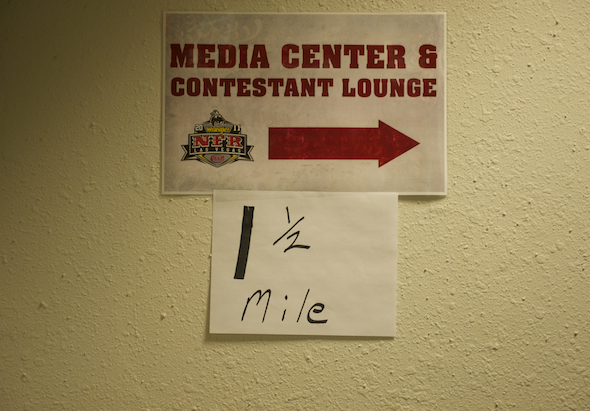 Matt: NFR Diary – What Do You Want to Know? If you’ve been around here for a while, you might remember my Wrangler National Finals Rodeo running diary from 2011. After being banned last year (politics!) I recently was approved for credentials for this year’s “Super Bowl of Rodeo”. I have two magazine clients, and a handful of commercial clients, and will be in limbo in the desert for 10 days shooting the best cowboys, cowgirls, and livestock in the world. Two months out I have already started preparing (studying my pictures from last time and creating code replacements for captions). I’m thinking about doing another diary this year, but I want to put it up for discussion first. I’m happy to share my stories, but since we preach thought and preparation over and over again, I want to hear questions you have about how to planning, traveling, deciding how and what to shoot, workflow, delivery, and anything else relevant. What would you want to know if you were getting ready for a shoot like this? Some questions, apologies if there are a bit much. What have your found to be most important thing you have to do to prepare for an event like this? How do you decide what to gear to take along? What have your learned to leave at home? Any tips to circumvent strict airline regulations on weight and size of your bag’s restrictions. I have had some serious trouble with low-cost airlines like Ryanair, Easyjet and Transavia? Do you make backup on separate storage before you travel back home? How do you track who is who after you have see 100+ riders pass by and ensure you captions are correct? You refer to “code replacements for captions” what, I’m not sure I understand what you do? Any tips on how you have learned to optimize your workflow during an event? During a (surfing / kite surfing) competition event I’m usually exhausted after 8 hours of shooting as there are very little breaks. I have missed some important heats recently at the end of the day. I do not know Rodeo but from the little times I’ve seen it on TV you have a heat system with points scoring/”time on bull” so guess you have the same problem in Rodeo. How do you balance your energy and ensure you stay focused at the right time? How does a typical rodeo event day looks like? I imagine something like this: arrive at press room, gear check/clean, lock bags to something immovable, to stadium, pick locations, shoot, move around, shoot, back to press room, import to laptop, edit, upload to photo editors, back to to stadium and over again. What else? How’re you going to balance the material you’re going to sell to the magazines? Unless they have very distinct “visions” on rodeo, they’re probably competitors. The comercial clients in Rodeo make a clear request for the photos they want to see or do they leave you to “shoot at will”? they cover different events, no overlap. They give me lists of their people and a couple of idea, but mostly they trust me to do the rest.